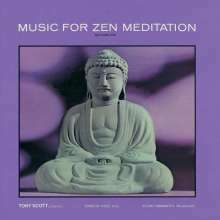 Der Artikel Tony Scott (1921-2007): Music For Zen Meditation wurde in den Warenkorb gelegt. The Zen, or spiritual, musical repertoire became established as melodies, initially improvised, and later memorized, notated, and passed from one Zen monk to another. This music celebrates the sound of nature and the player's understanding and joy in being alive. Long before the term New Age was born, jazz musicians were drawn to the improvisational quality of the music of Zen, the ancient Japanese quest for enlightenment through meditation. Against the traditional sounds of koto (table harp) and shakuhachi (bamboo flute), Tony Scott, supreme Western jazz clarinetist, invites listeners to a meditative celebration of nature in Music for Zen Meditations -- music to live by. S. Thielmann in stereoplay 1 / 06: "Ein Juwel von entrückter Schönheit!"